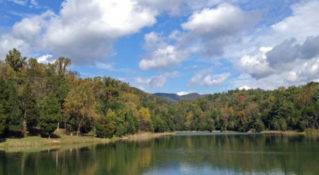 Buffalo Creek is a Special Regulation fishery. Buffalo is a typical spring creek supported by several natural, cold-water springs that keep temperatures comfortable year round for its population of brown, rainbow, and brook trout. As a Special Regulation fishery, anglers may only harvest two fish per day above the length of 16”. The state stocks this stream annually and the abundance of natural food in the stream leads to some outstanding growth rates for resident trout. While typical trout caught range from 10-14”, larger fish are not uncommon and trophy fish over 20” are always a possibility. Angling pressure can be high on this small stream during peak season and the fishing can be challenging. However, persistence is usually rewarded especially for those who are willing to ply the less-pressured sections of the stream. From the Lexington Visitor Center, drive east on Washington Street to a left at the stoplight onto East Nelson Street (US-60). Continue .2 mile to a right onto Lee Highway (US-11 S Bypass). Continue straight through the stoplight and onto Link Road / Thornhill Road / Collierstown Road (Route 251). Drive 5.5 miles to cross the Thomas S. Dixon Bridge; take the next right to remain on Route 251. In 1.6 miles, turn left onto Bluegrass Trail. Proceed about .25 mile and look for the large brown Special Regulation Virginia Department of Game and Inland Fisheries (DGIF) sign on your left. 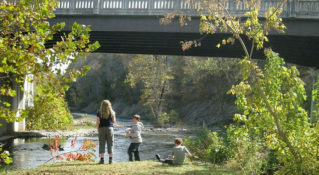 The fishing area extends upstream to the Jerry Hines Memorial Bridge. 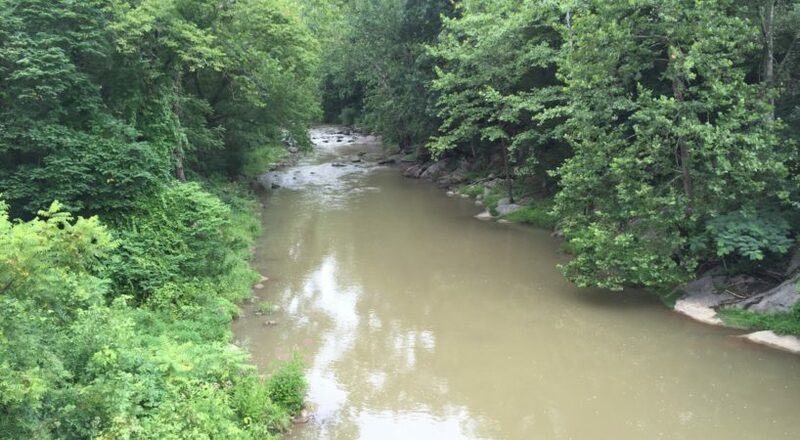 The second Buffalo Creek fishing section is at the confluence of North and South Buffalo Creek branches. To locate this area, starting from the first section above: proceed southwest on Bluegrass Trail (Route 612) about 1.5 miles to the intersection of Route 611 (South Buffalo Road) and look for another large brown VDGIF sign. This area extends downstream for almost a mile. Please respect all landowner private property. 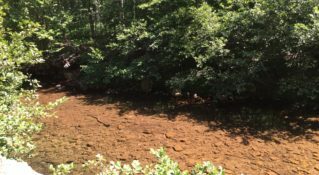 In addition to a valid Virginia fishing license, a landowner permit is required to fish Buffalo Creek. These permits are free and available online from the VDGIF. 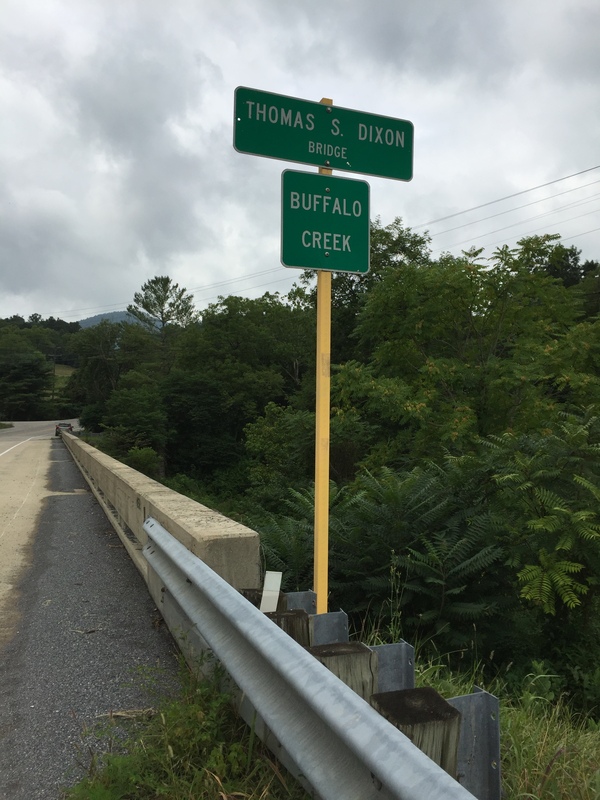 Access to Buffalo Creek is granted by participating landowners in this unique public-private partnership. A map of areas open to public fishing is available from the VDGIF. Breakfast at Lexington’s go-to greasy spoon diner is a must. Lexington Restaurant offers short-order service to booths or the 1950s counter, or to the dining room in the back. Get comfortable and fill up before heading out to the creek.